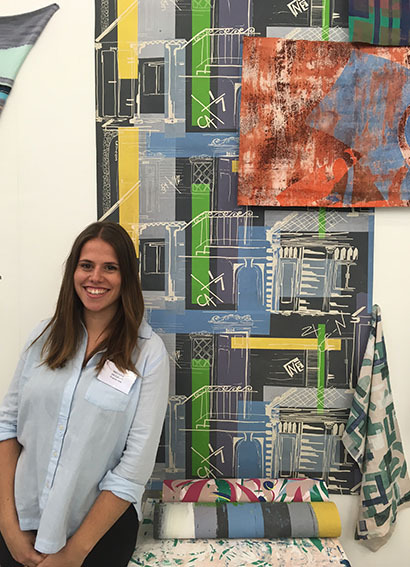 Melissa Ougham, who has just graduated in Printed Textiles at WSA, was selected from hundreds of graduates around the UK to take part in Texprint 2016. Those selected showcase their work in London before showing at PV in Paris in September. It is an amazing opportunity for new graduates to meet with exciting industry contacts and become professional designers. Melissa has been shortlisted for a 7 week internship in Como, Italy via Texprint. Congratulations Mel! This entry was posted in Textiles and tagged Graduate Show, Industry, Printed Textiles, Texprint 2016, Winchester School of Art by Caitlin Hinshelwood. Bookmark the permalink.